One of the great things about holy well research is finding a site recorded in an old work, doing field work to find it – and then finding it! I recently discovered a copy of Bygone water supplies, by J. Steele Elliott which I previously thought was an article and not a book. I had a photocopy of this but this was only of the text once I had opened the work I discovered that at the back of the work it was copiously illustrated with sepia photos of which a large number were of holy and healing wells. Which was a surprise and a useful tool for field work. How many still existed and how many if they survived looked the same? Bedfordshire is a little covered county in holy and healing well research and Steele Elliot’s work is the only one to have covered the subject at all. Hope includes a number of sites, although one of these is actually in Huntingdonshire! “Here is a great plenty of useful stone; lately discovered gravel; and several good springs, two of which have been reputed medicinal. One on the north-east, whose water has not been analyzed, yet well known to be mildly cathartic. That on the north-west has been so celebrated as to obtain the name of Holliwell for itself and two closes, through which it runs into the town”. Yet despite these noted, no researchers appears to have looked into the survival or history of the site. The first clue is that the spring is recorded on the north-east. Looking at the early OS maps failed to identify any well named holy, holliwell, holiwell or haliwell, but a spring was marked approximately to the north east on the old maps. Checking the modern map the well was still there and interestingly a footpath crossed close enough to access. Elliott Steele (1933) records that it lay between Village Farm and Great Wood, in significantly called Waterhouse Field, Grass Holiwell and Ploughed Holiwell fields adjoined it. 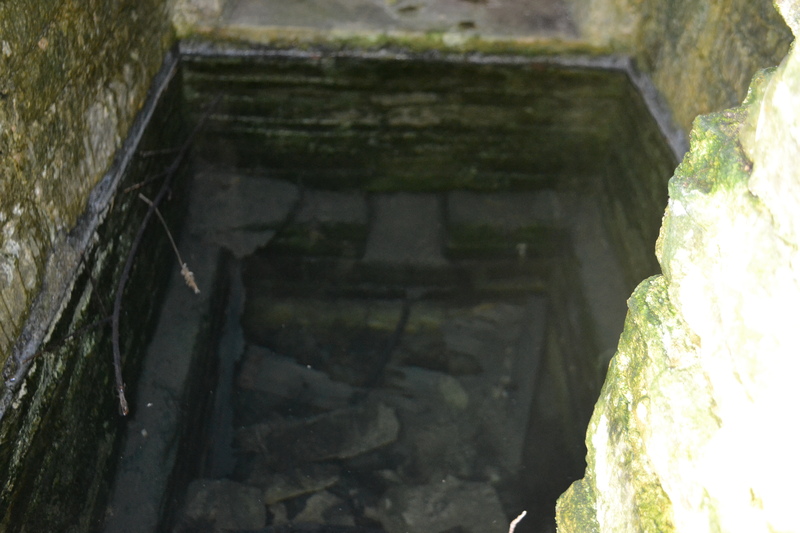 The photo shows a substantial stone structure but the clue to the locating the holy well and confirming the site was a large tree in the background. If that was still there that would help confirm that the spring and holliwell were the same. Travelling across the footpath the tree was evident and a tree lined gully was apparent to the right. Interesting the field was being seeded with grass was this Grass Holiwell field? Could this be where the holy well was? Carefully veering off the footpath, apologies to the landowner but I was careful not to damage any emerging crops, it was evident that some sort of structure was present albeit overgrown. Going around and climbing down into the gully I was confronted by the structure shown in Elliot’s 1933 photo (I presume this when it was taken but the photos date from 1870 till this date). Much of it unchanged bar the lintel over the door had gone and the stones just above it. Peering inside it is clear that this was a well-built substantial structure. The water arose clear and of considerable depth in a square chamber it flowing from a shute at the bottom. At the bottom could be seen the remains of the lintel and the other stones. The most curious feature was the arched niche at the back. What was this for? If it was to place buckets on it appeared too narrow and inconveniently placed as one would have to reach over some deep water to get to it. Its ornateness suggests it may have been built to hold religious objects but if so it would make it unique in the county and indeed these are rare features outside well known holy wells such as those in Cornwall. Was this once then a significant site? What was it dedicated to? The church gives no clues it’s to All Saints but there was an earlier church as the town was recorded as a Minster in 1220. 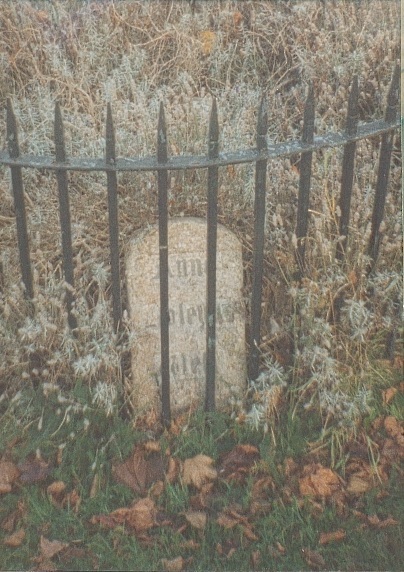 As James Rattue records in his 1999 The Living Stream there is a strong correlation between Minster towns and holy wells. This would be more supporting evidence. The settlement itself has a considerable history having Roman, Danish and Saxon histories perhaps attracted to the copious supply on this spring. Odell was an important settlement post the Norman conquest and remains of a castle exist. 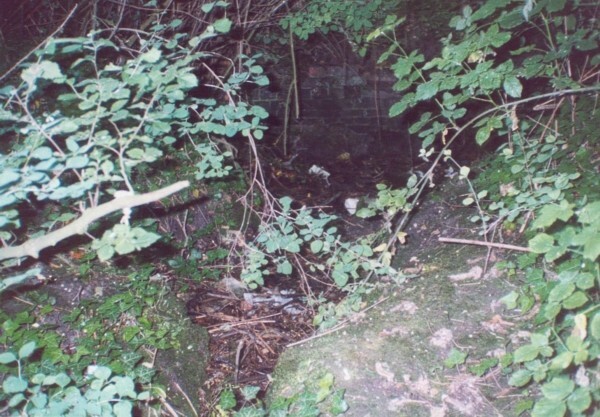 It is possible that the well was constructed by the castle as their supply although there is a substantial well on the site called King John’s well. Of course the name could easily derive from Old English hol meaning ‘hollow’ but the versions of holli and halli suggest it is a genuine holy well. It is good to see the well survives but clearly it needs some TLC, perhaps a local history group could raise funds. Now the Holliwell has been ‘rediscovered’ perhaps it could be preserved. 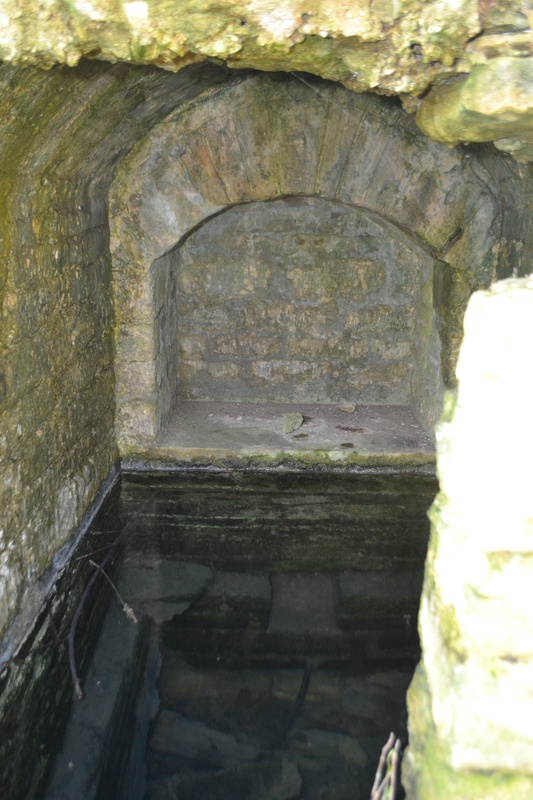 So writes John Bunyan in the puritan classic Pilgrim’s Progress, the sepulchre in question is believed to be Stevington’s Holy Well (SP 990 535) in Bedfordshire. Bunyan only lived five miles away and is known to have preached at the nearby cross and meadows near the well. J. Steele Elliott (1933) work on wells of the county in the Bedfordshire Historical Records Society , so far the only account notes that the Manor house was used for ‘invalids and pilgrims attracted by the well’s virtues’. One of these virtues was to cure eye complaints as well as its waters being renowned in not freezing or drying out. However, Elliott is probably confusing the manor house for the Hospitium the ruins of which were there in the 1600s and may have been built for pilgrims visiting the well but there is no evidence for either being used! “One of the biggest labours was the Well Dressing. This year Jane O’Connor led a team of volunteers patiently pricking in everything from petals to grasses, from seeds to egg shells to form the representation of the famous picture of Bunyan languishing in his prison cell. An innovation this year was the second collage prepared by the children, somewhat optimistically titled ‘Sunny Stevington.’ In the event the optimism was justified; we had the best two days weather wise of the year so far. We welcomed the Bishop of Bedford for his first visit to Stevington. He rose to the occasion and managed in his sermon to bring together the significance of the Bunyan, the Well and the visit of the Virgin Mary to her cousin Elizabeth under the theme of pilgrimage. The choir sang as well as I have heard and the service was completed with a procession for the Bishop to bless the Well followed by refreshments back in church. It was really gratifying not only to see so many in church, but also to note the number of people who appeared just to see the well dressing. And long may this tradition continue and bring more modern pilgrims to be drawn into the peaceful place which is Stevington’s Holy Well. In my searches for holy wells, here are ten of the oddest places I have found them. If you know any odder ones let me know. I’ve hyperlinked to megalithic portal for most were a page exists. Note due to the locations some of these sites are on private land. Under a church. 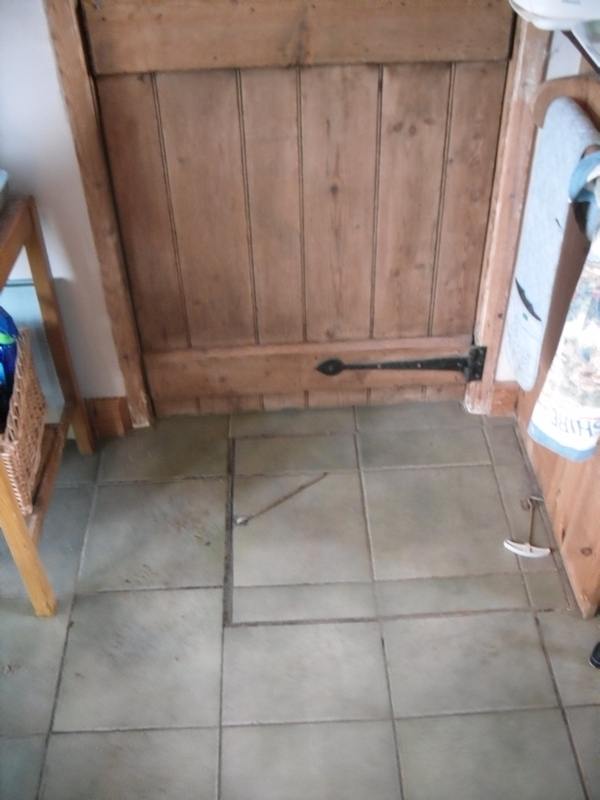 Much is spoken of the Christianisation of pagan springs by siting churches over them but the evidence is not common, St Ethelbert’s Well in Marden Herefordshire is one such example, located in a room to the west end of the nave, existing as a circular hole in the carpet mounted by a wooden frame. In a bridge, Bridge chapels are a rarity in England and so were bridge holy wells and as far as I can tell of those said to exist at Barking in Essex and possibly in Nottingham at Trent bridge, only Biddenham’s Holy Well still survives in an ancient bridge, probably dating from the 17th century its worn steps lead down to a chamber beneath the bridge, although access is hampered by a locked gate. Under my kitchen. 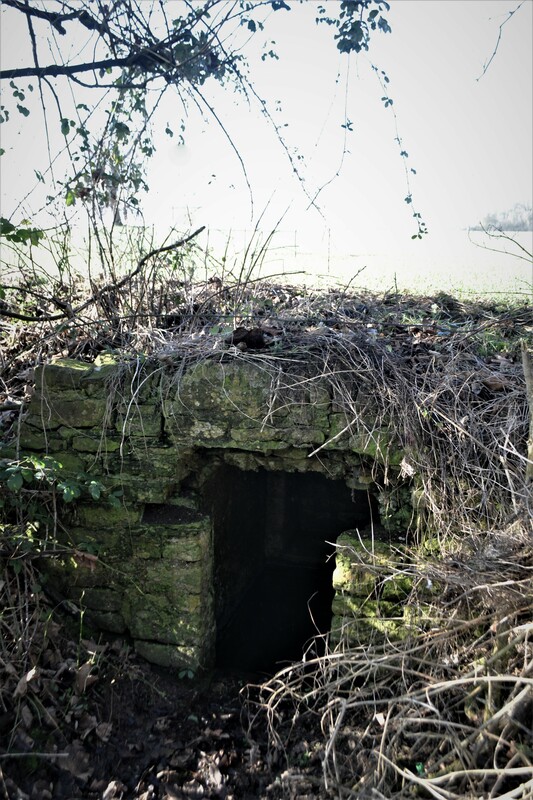 A visit in search of St John’s Well near Retford, Nottinghamshire reveals a subterranean rectangular stone lined chamber designed to be a plunge pool for body immersions beneath a trap door in a person’s kitchen. More can be learned here or in Holy wells and healing springs of Nottinghamshire. On a golf course. Surprisingly, despite what you would think would be an inconvenience, a number of holy wells arise between the bunkers and fairways of the countries golf courses. In Kent we have St Augustine’s Well at Ebbsfleet, Oxfordshire’s Holy Well at Tadmarton, and Jesus’s well at Miniver, Cornwall. 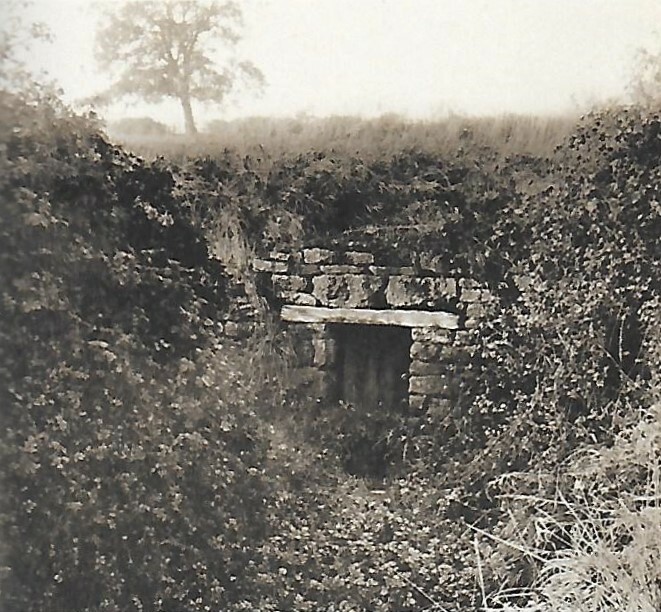 My favourite, although it may not be a holy well per se (deriving from O.E holh or hol) is Holwell on Newstead Golf Course, Nottinghamshire. A natural fern, moss and liverwort adorned cave whose sweet waters are still available via a cup attached to a metal chain. In the grounds of a school. As long as they don’t fill them with paper aeroplanes and rubbers, wells can survive in school estates well. 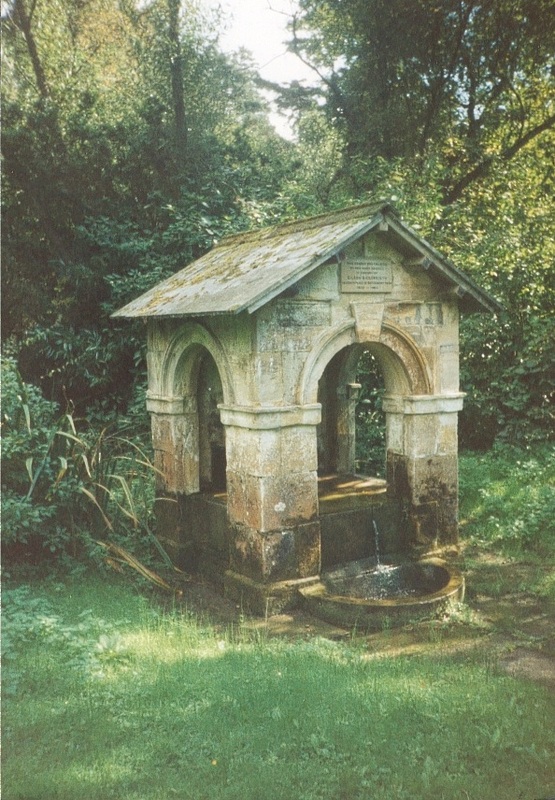 The best example is the Lady’s Well located within the Bedgebury School Estate, a large sandstone structure has been raised over the spring either to celebrate Our Lady, original landowner Vicountess Beresford or perhaps a past Bedgebury School Headmistress! Amongst the rock pools on the beach. Although now dry, St Govan’s Well and its associated Chapel are undoubtedly the most atmospherically positioned of any of this list. 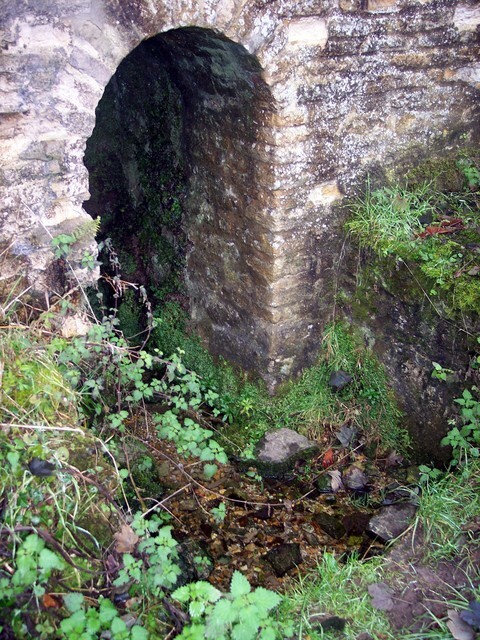 A small stone well house covers the spring which has either dried or being filled up by too many pebbles. In a cave. Perhaps the most atmospheric of holy wells is the Holy Well of Holy Well bay near Newquay Cornwall. A large sea cave reveals a magical multicoloured series of troughs made by a natural spring that has dripped its mineral load over the rocks and formed a perfect immersion set up. Its origins are linked to the resting of St. Cuthbert on his way to Durham. Crotches were left on the beach outside by healed pilgrims. 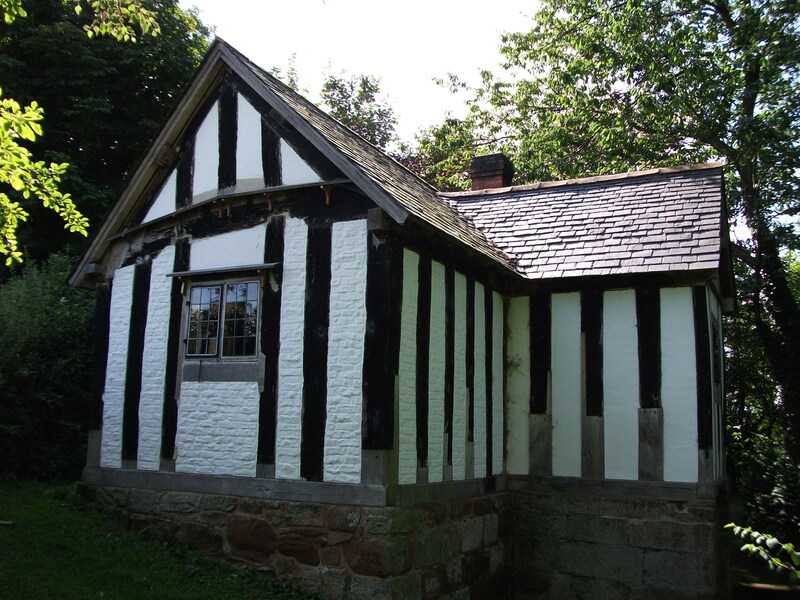 Under a holiday home and an old Courthouse – St Winifred’s Well Woolston is a delightfully picturesque black and white tudor courthouse now a holiday home sitting up top of the chambers of St Winifred’s Well. 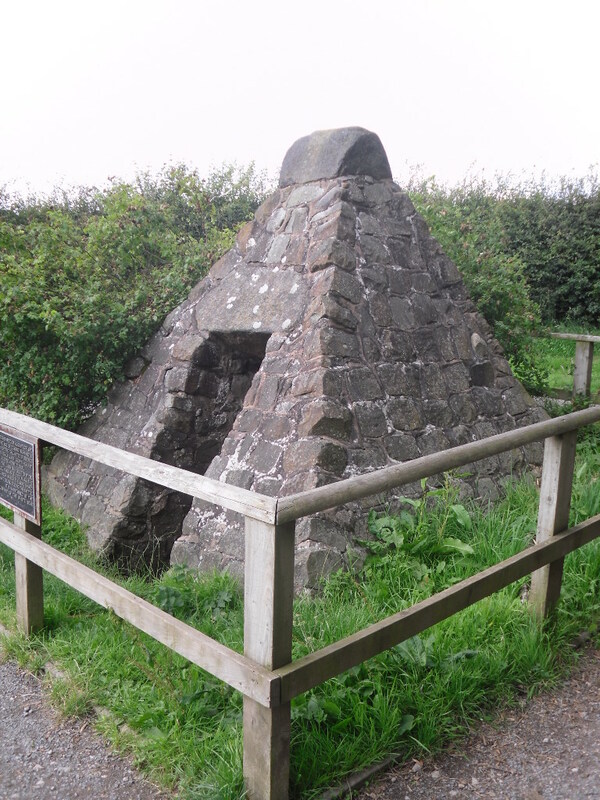 A site associated with the pilgrim route to her shrine in Shrewsbury and well at Holy Well in Flintshire. Restored in a new housing estate. Developers of new estates are not always sympathetic to history perhaps and certainly not water history, but the designers of De Tany Court in St Alban’s took good advice and preserved the newly discovered St. Alban’s Well, lost for decades in the grounds of the nearby school’s playing fields, in their new housing estate and made it a garden feature.